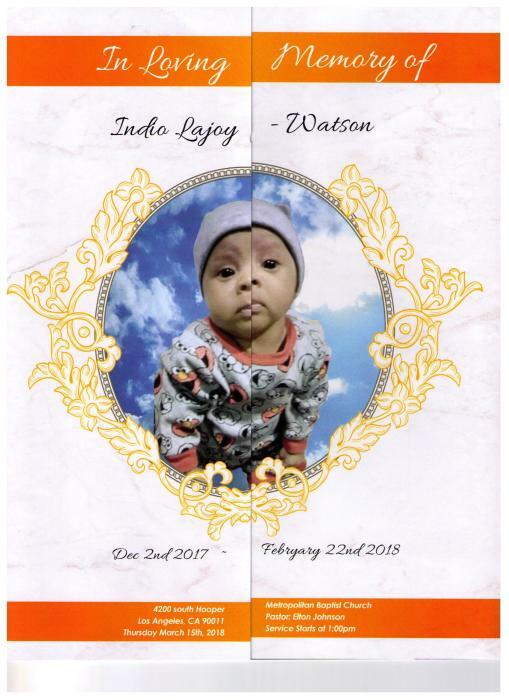 Indio LaJoy Watson was born on December 1, 2017 in Los Angeles, CA to Lajoyce Mechelle Thomas and Anthony Curtis Watson. He brought joy and happiness to all whom he smiled upon. The lord called him home on the morning of February 22, 2018. He was proceeded in passing by grandfather Willie LaJoy Thomas and great grandmothers Johnnie B. Richardson and Mary Basore. He leaves to cherish his memory his mother LaJoyce Mechelle Thomas, Father Anthony Watson Jr.. Grandparents Bonnie Basore Watson and Anthony Watson Sr., Aunts Latasha Watson, Charmaine Watson, Uncles Kenneth R. Mack and Sean Watson. Also siblings Antanisha Watson, Anthony Watson Jr., Antaneka Watson, Lattecia Watson, Armon Watson, and a great host of cousins, great aunts, and great uncles, family, and friends.